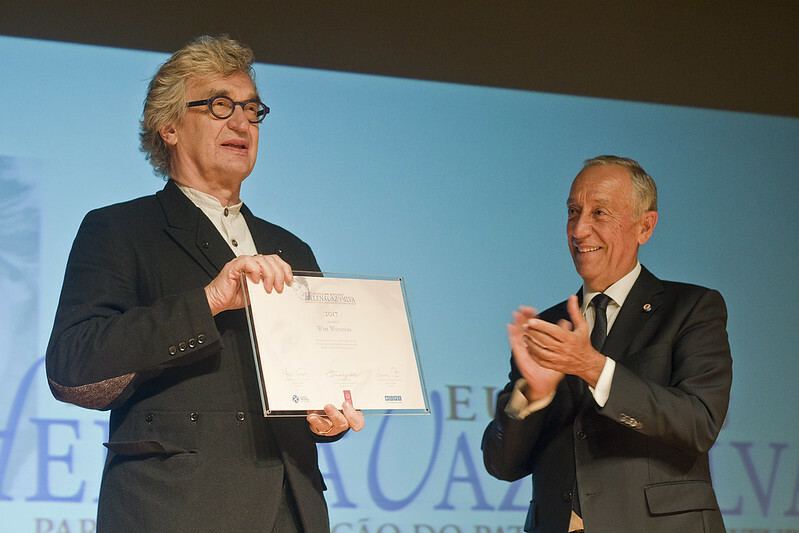 Wim Wenders, the renowned European film director from Germany, received the Helena Vaz da Silva European Award for Raising Public Awareness on Cultural Heritage 2017 at a high-profile ceremony held on 24 October at the Gulbenkian Foundation in Lisbon. “Our heritage in all its diversity is the true backbone for the future of Europe,” stated Wim Wenders in his powerful and impassioned acceptance speech. 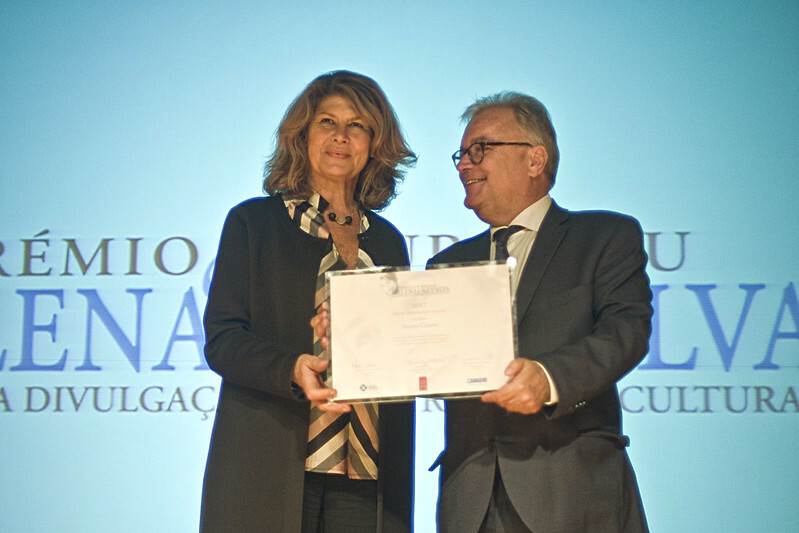 On the occasion of the 5th anniversary of the Award – established by Centro Nacional de Cultura in cooperation with Europa Nostra and Clube Português de Imprensa –, the Jury also gave a Special Recognition to Silvia Costa, Member of the European Parliament from Italy. The ceremony gathered more than 300 people was honoured by the participation of the President of the Portuguese Republic Marcelo Rebelo de Sousa. Wim Wenders, who was unanimously selected by the Jury as the winner of the Helena Vaz da Silva European Award 2017, is recognised for his unique contribution to communicating Europe’s multicultural story and ideals. In his moving acceptance speech, the German filmmaker spoke about the past and present of Europe which was marked by exchanges and hopes as much as by wars and crises. For the future, he stressed the need to promote dialogue and understanding between peoples through our common heritage. “Europe is not the problem, it is the solution. It is a mighty protective roof (this is my favourite image!) and a solid structure. But it can only cover those under its roof, not those just standing next to it! It can protect languages, traditions, regions, minorities, cultures and local industries better than encapsulated, sealed-off small national entities that will implode, be blown away or have their people remain isolated within,” warned Wim Wenders. “But what does keep our roof up in the future? The only possible answer is: Our BEST! Our common heritage! What is stored in our common culture as well as in all our different ones. (…) Our heritage in all its diversity is the true backbone for the future of Europe. And that includes all our regional cultures and tastes; languages and accents, our music, our poetry, our architecture, our theatre, and our true common language called cinema,” he emphasized. Wim Wenders received the Helena Vaz da Silva European Award 2017 from the President of the Portuguese Republic Marcelo Rebelo de Sousa. On this occasion, the German film director was also honoured with a high decoration – the Portuguese Honorific Order of Merit. Guilherme d’Olliveria Martins, Administrator of the Gulbenkian Foundation and member of the Jury, paid tribute to Silvia Costa, a leading Member of the European Parliament’s Committee on Culture and Education, who was recognised for her remarkable contribution to the development of an EU strategy on cultural heritage and to the promotion of the European Year of Cultural Heritage 2018. Europa Nostra’s Secretary General Sneška Quaedvlieg-Mihailović also praised the exceptional dedication of Silvia Costa: “Europa Nostra and I could witness first hand your outstanding commitment in favour of both cultural heritage and Europe. We are therefore thrilled with this most deserving Special Recognition granted by the Award’s Jury. We believe that this is a most fitting way to mark the 5th anniversary of the Award, named after the late Portuguese cultural activist, who was also a Member of the European Parliament, Helena Vaz da Silva”. In her acceptance speech, Silvia Costa expressed her heartfelt thanks for this important European distinction bearing the name of Helena Vaz da Silva. “As Chair of the European Parliament Committee on Culture from 2014 to mid-2017, I have fought to re-introduce culture and heritage among the priorities of the programme of the European Commission. Not alone, but with the fundamental support of artists, cultural professionals and European networks, such as Europa Nostra, and several countries, including Portugal”, she highlighted. This Special Recognition from the Award’s Jury, was presented to MEP Costa by the Portuguese Minister of Culture Castro Mendes. Isabel Mota, President of the Gulbenkian Foundation, Maria Calado, President of the Centro Nacional de Cultura, and Dinis de Abreu, President of the Clube Português de Imprensa, also addressed the audience. The Helena Vaz da Silva European Award for Raising Public Awareness on Cultural Heritage acknowledges exceptional contributions to communicating about Europe’s ideas and ideals embedded in our shared cultural heritage. The previous laureates of this Award are the Italian writer Claudio Magris (2013), the Turkish writer and Nobel Prize laureate Orhan Pamuk (2014), Maestro Jordi Savall, musician and conductor from Catalonia, Spain (2015), as well as the French editorial cartoonist Jean Plantureux, known as Plantu, and the Portuguese philosopher Eduardo Lourenço (2016). On the occasion of the Helena Vaz da Silva Award Ceremony, the two Portuguese winners of the 2017 European Union Prize for Cultural Heritage / Europa Nostra Awards were also celebrated: the Clérigos’ Church and Tower in Porto (category Conservation), which was presented by João Carlos dos Santos; and the Advanced Master in Structural Analysis of Monuments and Historical Constructions, a European programme coordinated in Guimarães (category Education, Training and Awareness-Raising), which was outlined by Paulo Lourenço. The two projects received high praise from the Portuguese Minister of Culture.